What is your vocation? I chose those words carefully because I realize many of us would get stumped by "what is your career?" or "what do you do for a living?" simply because we don't get paid much or anything for what we do. Also, many of us get paid for doing one thing, but we'd really consider our vocation, our chosen life's work, to be something completely different. What do you do, Kay? Well, thank you for asking. I'm still a full-time mom and homemaker, but also a minister to women - through my writing, teaching, speaking, mentoring, etc. Obviously, what I do doesn't pay much. But it's still my vocation. Now we know where this is leading. Simon and Andrew are fishermen now, but that's all about to change. They're literally minding their own business and Jesus walks into their lives. "Follow Me," He told them. Quite honestly, I snapped into line and followed Jesus just about as fast as Andrew and Simon did. Probably for the same reason they did too -- no one else (no fish?) was biting. 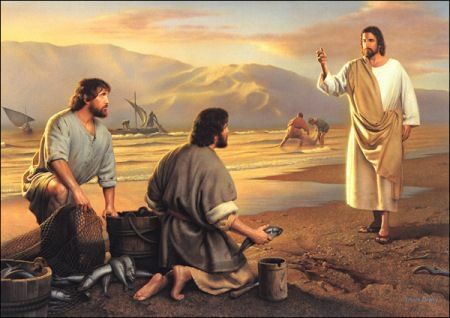 Actually I don't know whether Simon and Andrew were having a stellar day at sea or if they were sinking beneath the waves of bad luck, but they indeed dropped everything and followed Jesus. I'm sure they had no idea what lay ahead of them, hindsight being what it is and all. But here's the interesting thing. Let me give you rest of Jesus' line from that passage. "and I will make you fish for people!" Do you see what Jesus was offering? I'm not sure they could have identified the allure (get it...allure...a lure...fishermen...hee, hee!) of Jesus' promise at the time, but something about what He enthusiastically guaranteed struck a chord with these men. Jesus was offering to elevate their vocation. They were still going to be fishermen, but now they would be fishing for men, for souls, for lost sheep, for children of the King. It probably appeared to some that they were taking a detour in their profession - walking away from their boats and nets and steady income. But in the end, in the real end, as in Revelation chapter 4 verses 10 through 11 end, they were getting a promotion. Same vocation, elevated position and responsibilities. I'm the kind of person, I regret to confess, who has always wanted to be important. I have this unyielding hankering to be significant, to matter, to be crucial to the big picture. If I try to feed that need the fleshly way, and I have, I end up doing things like bossing people around, hogging the limelight, talking too loudly, arguing until I get my way, etc. Ugly stuff. The Psalmist, like me, wants his work to matter. He wants what he does to have some significance, some importance, some lasting value. And he knows that God alone can give him that kind of influence. Maybe I seem to have jumped around today. This has been one of those topics where I know what I want to say, but I'm not sure I'm getting my message out very clearly. Here's the bottom line. Whether I'm a housewife, a teacher, a nurse, a writer, a mother, or a fisherman, Jesus can elevate my vocation to one of worth and significance. When I turn that line of work over to Him, He may redirect me a little, give me a few additional challenges, broaden my scope, or even intensify the struggles, but He'll also give my work a little permanence. He'll undoubtedly cause me to focus more on people than on the craft. And He'll surely require me to "bring my faith to the office" as they say. But in the end, He'll make my work count...and count....and count. I left behind my original career plans over 20 years ago. It hasn't been easy. I'm making wayyyyy less money than I originally planned to. I haven't earned any great titles or accolades. And instead of a corner office with a view, I have one in my home right next to the laundry room . But I'm doing what I was called to do...and I love it. Has Jesus changed your plans any? Looking back, would you say He elevated your vocation? When you really think about it with eternal perspective, would you agree that His call was a promotion and not a demotion? And I'm not saying you have to have had the same story as me. Maybe you're still in the classroom when you had planned to go into school administration. Maybe you put your career aside to be a fulltime mom and homemaker. Maybe you left your chosen path to accompany your husband on his. Or perhaps you've switched careers completely midstream, laying down "your nets" and picking up a pen, a scalpel, a textbook, or a paint brush. The real question is "Did Jesus come along and say 'Hey! Follow Me and I'll make you fishers of men!"